I’ve been on kind of a hot dog/sausage kick recently, but this post is special. The Wurst Bar is a relatively new addition to Ypsilanti, Michigan, and came highly recommended to me from a friend of mine. It’s a pretty standard college bar, drinks-wise, but what separates it from the rest (and gives it its name) are the numerous bratwursts they prepare on site and serve. Their bratwursts range from classic style to some interesting variations, namely rattlesnake. You better believe I’m not gonna pass that up. I hate snakes, Jacque!! I hate 'em!! I opened with the Rattlesnake Chorizo. In addition to the snake meat, it had (primarily, I believe) pork, chipotle, oregano and red wine. I had it on a pretzel bun topped with sauteed onions and sweet peppers. It was surprisingly delicious. I don’t know if I could tell you specifically what rattlesnake tastes like, but the brat had a full flavor, and the chipotle gave it a heat which I feel is appropriate to eating the meat of a venomous animal. The toppings went well with it, and the saltiness of the bun helped offset some of the spiciness. I’d definitely recommend this one. 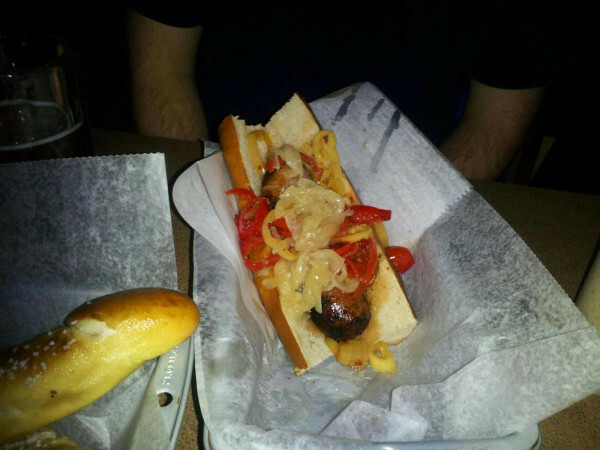 I followed it up with the PBR Poached Bratwurst, which is one of their standard brats. This was kind of a mistake on my part. While there was nothing wrong with it, it couldn’t really compete with the chorizo from a novelty perspective. The bratwurst included majoram, ginger, celery seed, and coriander along with the pork. It was a solid, tasty brat, but it didn’t have the hook that some of the more unusual fare did. I’d definitely recommend checking out The Wurst Bar for some bratwursts I can’t imagine you’ll find anywhere else. They offer brats made from bison and lamb, as well as alligator (although if I remember from New Orleans, alligator basically tastes like chicken, but with a texture more similar to fish). The regular brats are $5.75 and the more whimsical are $7 a la carte, so it’s not the kind of place I’d go every day. Still, if you’re in the area and looking for something decidedly different, stop by.